As I detailed in my original post, the goal was to cut my grocery bill by creating a meal plan based on things I already had. In theory, I would have to buy less and would thus spend less. In theory that’s great on paper. Reality has another thing in mind. Firstly, I did make my meal plan. And as mentioned before, I struggle at sticking to any type of meal plan or self-imposed schedule. So, needless to say, my first attempt to stick to my meal plan wasn’t successful. My biggest mistake was I didn’t take into account Halloween. The first day of my meal plan we had a Halloween party so neither Davis or I were hungry for anything when we got home. Meal was pushed to Monday which was actually Halloween. Again, no time for supper and Davis was too full of junk from her daycare party to eat anyway. Day one meal pushed to day three. We did well on day three and four but then day 5 we were at the vet and I ended up buying Chinese take-out – which was a waste of $20 because it was gross and Davis wouldn’t eat it anyway. By this point I gave up on said meal plan and just cooked what we had. Did the meal plan actual reduce my grocery bill? Not really. 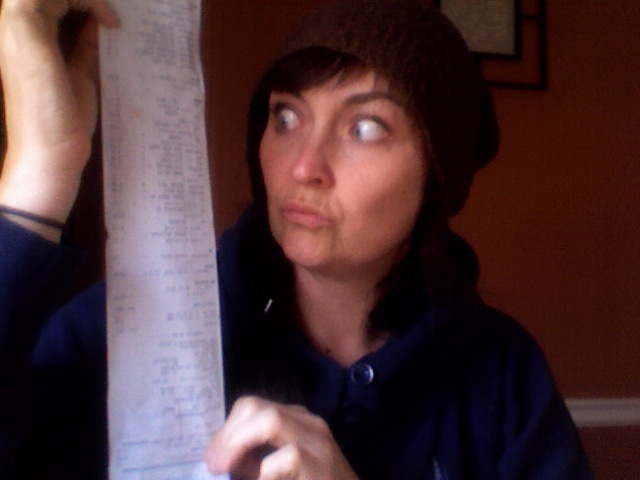 I spent about $97 in groceries that week – and that was only buying the stuff we needed. Ugh. Add the $20 for take out and it’s $117 in food that week. My second major mistake was I didn’t take into account being tired from work. And toddler tempers and desire for your attention when you get home from work. It’s hard for a working parent to cook a full on meal every night after work. Even harder when it’s only you doing all the housework, playing and cooking. Planning left over nights and meals that can be frozen for quick healthy meals later is really important as it gives you a break from the rush of come home, cook, clean, play, clean, bath… you get the picture. Now it’s close to the end of the second week and no, I have no meal plan this week. I thought I’d just get a few things that I needed but that turned into a lot more than the few items on my list. It’s amazing the things you remember you need when you’re there. And I’ve realized when Davis is with me it’s harder for me to stick to the list. If only we could leave our kids in the car like they did in the 70’s (joking… sort of.) This week’s grocery bill is $109 thus, I’m still on the quest to cut my spending in this area. I’ll attempt another meal plan and see if I can refine it to make it easier to follow. If after four weeks this doesn’t work I’ll try something else. Trying is always better than giving up. How do you keep your grocery bills reasonable? Got any tips? Please let me know as I’m drowning in the sea of food costs. This entry was posted in Financially Fit, Healthy Habits and tagged budgeting, cutting grocery bill, getting paid, meal plans, saving money by njsullivan. Bookmark the permalink. I make meal plans for no other reason, but to ensure that I am eating healthy. Do I try to follow it, not always. I buy items when on sale. I, too, use coupons where I can, but it’s near to impossible to do with fresh fruit and veggies. So I buy what’s in season. If there is a special, I buy it and focus my meals on that food. I love to look at the flyers and see what’s on sale. I have also been known to spend a whole Sunday cooking for the week and freeze it for later on. That way, it’s already planned and coordinated. Not sure how old Davis is, but my aunt and uncle had a very good food planning system. When the kids were older, they would be involved in the meal planning. They prepared a sheet with a list of the favorite family food items. The family decided on the meals, et voila, the meals were planned. While it worked well with 4 people (there weren’t many left overs), it did help in my aunt’s grocery planning. Every once and a while, I make a commitment to go through my cupboards and freezer and eat what is there. I’ve found this to be interesting and I have come up with some neat combinations and recipes for next to nothing. Just a few more suggestions. thanks for the awesome suggestions megret! i definitely try to get Davis involved in as much as i can around the house (she’s already pretty good with cleaning for a 2year old i think)… right now another pain of meals is her constant “i don’t like it” even when it’s something she loved last week. *sigh* ’tis life with a toddler – but i look forward to meal planning with her when she’s old enough. u know what i’ve started doing with left over soups is bottling them… i find putting them in the bottles hot seals them and i have the benefit of coming from a can and don’t have to take out to thaw. i’m with you on the trying to use what’s in the cupboard & freezer.. especially cupboard stuff i feel like i hoard stuff. lol. Use a crock pot. Crock pot meals are usually super easy to make and yield left-overs! You may have to eat the same thing two or three times, but you don’t have to cook as much! i love my crock pot and i definitely don’t use it as much as i should. been trying to find out if cooking in the crock pot is indeed less energy than a conventional oven… i know they say it is, but i’ve been trying to find out the watts used for say 6 hrs of the crock pot vs 1 hour of the oven… hmmmm. btw: have you ever done a chicken in one? really good.